The latest shape my eyes are in love with. The deer ferns (Blechnum spicant) are in various stages of unfolding, and I have opportunity to observe most of them as I commute up and down the Pacific Crest Trail with the chainsaw over my shoulder. We’ve been working on that big pile of logs–a puzzle to unravel. These ferns are growing on the edge of a turnpike over a swampy area. Deer ferns have infertile leaves that radiate out from the center of a clump, and lie fairly flat to the ground. 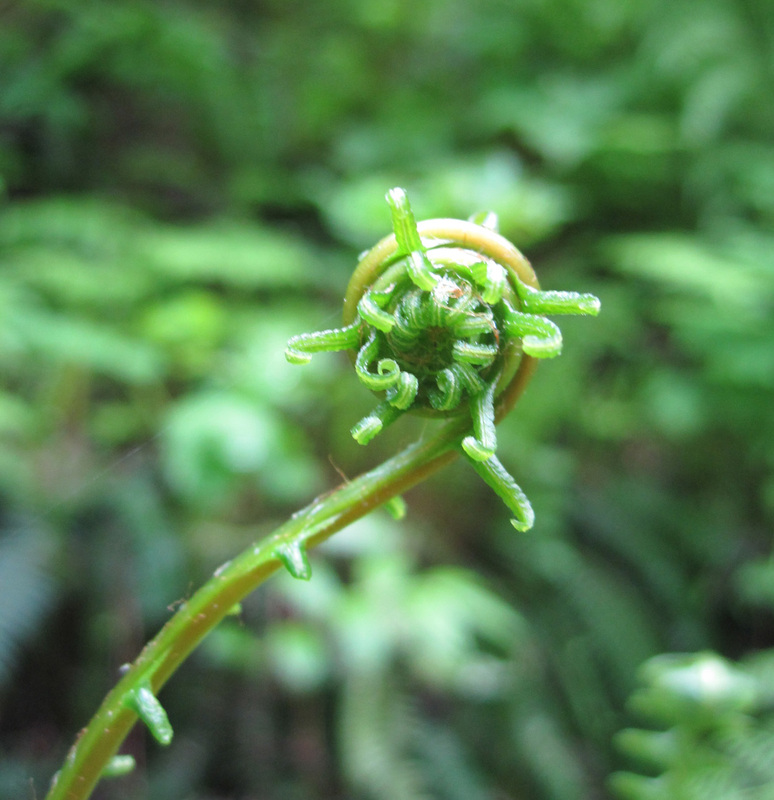 The fertile fronds come up from the center and stand erect. The spores will be released from these later in the season. This year’s leaves are a fresh yellow-green, contrasting with last year’s darker evergreen leaves. I could happily plop down on the trail and gaze at the opening spirals and spreading triangles, while water trickles and thrush song bounces in the tops of the sheltering conifers. I could ignore roar of the traffic from Interstate 90. Sometimes the trail crew imagines it’s a big waterfall, or the ocean. All those people in cars and trucks, oblivious to the green magic unfolding right here in front of my eyes. A great teacher I trust says for me not to rail aginst my own kind… that humans are “natural”, too… as natural as anything in this marvel of a place we were born to. I try. But I can’t make them seem a satisfying fit as a piece of the great puzzle.